[Via Satellite 07-02-2014] Inmarsat has chosen the SpaceX Falcon Heavy rocket to launch its upcoming joint-satellite, and furthermore has opted for up to two additional missions. A launch date for the double-satellite Europasat / Hellas Sat 3 — Inmarsat operating Europasat and Hellas Sat operating Hellas Sat 3 — has not been released, but Inmarsat plans to have the satellite ready for commercial service in 2016. The second launch vehicle opportunity is for the fourth Inmarsat 5 satellite, ordered from Boeing in 2013 as a spare for Global Xpress (GX). The pivot to SpaceX comes amid concerns over the Proton rocket’s ability to launch safely and on time after its recent failure in May this year. Inmarsat said in a statement that having SpaceX as an option to launch the fourth GX satellite as either a replacement or with an incremental Ka-band business case provides certainty for both the launch date and cost. The third launch vehicle opportunity is set-aside for future satellite missions. This could include an Inmarsat 6 generation satellite, though these are neither designed nor ordered. Inmarsat hopes to launch its first sixth generation spacecraft by the end of the decade. Inmarsat said it would make some limited payments before the end of the year. These will be captured in the company’s capital expenditure guidance, which will be provided in August when it reports second quarter results. Inmarsat is keeping the Falcon 9 as an alternative to the Falcon Heavy, should it see fit to switch rockets. The build, launch, insurance and operational costs of the joint satellite for Inmarsat amount to roughly $200 million. Arabsat subsidiary Hellas Sat is financing half of the launch cost. “We believe that SpaceX has demonstrated tremendous successful progress in its launch capabilities and is now a fully-credible provider of vehicles to support geostationary missions … in view of capacity constraints in the satellite launch market, Inmarsat believes that securing optionality today is an important business safeguard to mitigate future launch schedule risk,” Rupert Pearce, Inmarsat’s CEO said in a statement. With lift capability of 53 metric tons, the Falcon Heavy is slated for its first launch in 2015. Three Falcon 9 rocket boosters, totaling 27 Merlin 1D rocket engines, power the rocket’s first stage using kerosene and liquid oxygen. The second stage uses a single Merlin vacuum engine to deliver the payload to its proper orbit. SpaceX is planning a reusable version of the Falcon Heavy as well. 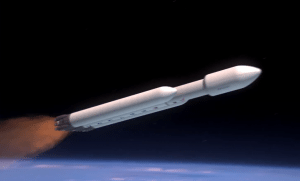 The Inmarsat-Hellas Sat satellite is the second commercial payload contracted to launch with the Falcon Heavy. Intelsat was the first commercial customer, signing in 2012 for one of its satellites to be launched into Geostationary Transfer Orbit (GTO). The Air Force has also contracted for two Evolved Expendable Launch Vehicle (EELV) missions in 2012. According to SpaceX’s manifest, the Air Force payloads are scheduled to launch toward the end of 2015 following a demo earlier the same year. Thales Alenia Space is building the Europasat/Hellas Sat 3 spacecraft. Inmarsat’s S-band payload is a critical part of the company’s in-flight connectivity plans for the European Union, which includes an Air-to-Ground network as well. Hellas Sat 3 fulfills one of Arabsat’s four-satellite expansion program. Hellas Sat plans to use the satellite to provide Direct-to-Home (DTH) broadcasts and telecom services. The 5.9-ton satellite is set to be positioned at 39 degrees east.